This was the hardest record and not because it was my first. The scale of what I was attempting was huge and it nearly didn't happen so many times. 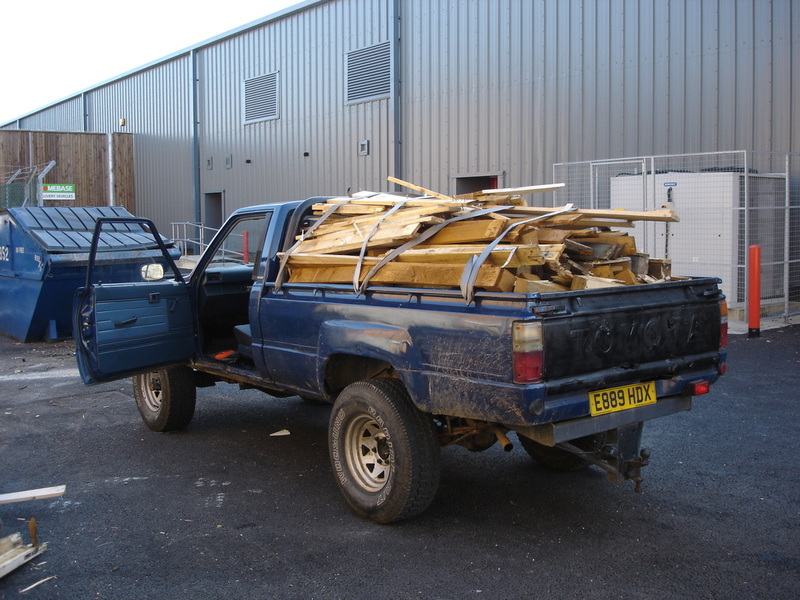 When I first said to people I'm going to build the worlds biggest fire although they thought yes that suits you nobody really believed me and it wasn't till I bought my beloved Hilux that my close friends started to see I was serious. So out I went after work collecting pallets and wood from various places and as time went on we found better sources and got better at packing more pallets onto the truck. In one load we could get 60 pallets on, which made the truck flex like mad but this kinda added to fun! The target was 800m3 of fire and once I got to 200m3 people started taking me seriously and believing that I was going to break the record. So people started to listen and when I went in to big companies they took notice and didn't think I was just pulling there leg. 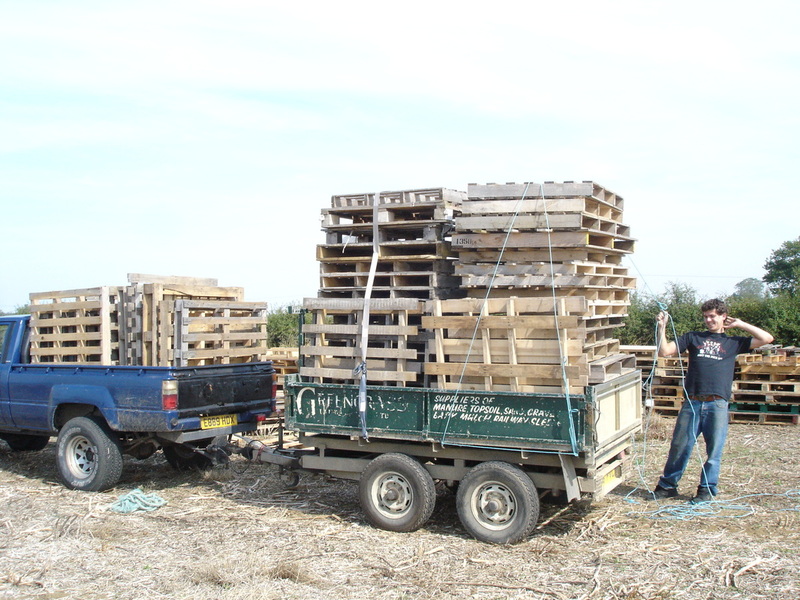 So me and Smithy (my main pallet collecting friend) started to gather more and more pallets going out 3-4 times a week! I also had pallet firms from nearby towns dropping stuff off as well so the pile started to get bigger and bigger and once 800m3 had past there was a sense of relief as I knew in some way I'd be successful, but it wasn't over yet! I had chosen the date 14th October for 2 reasons 1 that it was my birthday and 2 I was paranoid someone else was planning the same thing and the obvious date was bonfire night and if we lit them on same night only one would get the record so doing it before would safeguard it for 2 weeks at least. Eventually we collected 1600m3 of pallets, double the previous record! To make it amazing I wanted it to be tall and epic but 3 weeks before the date things went a little off course. WHY THE MODERN WORLD RUBBISH! Now thats a strong statement but thats kinda how I felt at the time. At the very beginning before I started building the bonfire I rang the Local Council asking what I needed to do before I was to hold such an event and there answer was in short talk to the environment agency and have insurance (covered buy farmers) So after the Cement firm had sorted the environment agony I thought I was good to go. 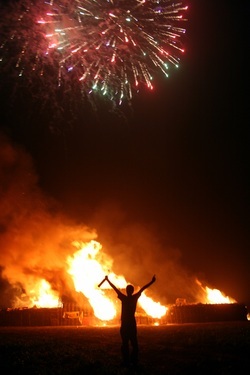 OH NO 3 weeks before the bonfire was to be lit I get a call! They start asking questions like; have I any disabled parking, is the field smooth and has no trip hazards, is there access for the fire engine (which is not allowed on fields anyway???) and I'm like well no because I didn't know I needed all these things and it's a field of course it's not smooth! I was providing two massive fields of free parking as they were worried about people parking on side of road. Then the fire brigade started panicking... and I'm like it's in a massive field in the centre theres nothing around it to catch fire. So after a lengthy meeting I had to promise them it would be a private do with just the people that contributed to the build and that would be around 50 people max... HAHAHA 500 people turned up! They also freaked out at the way we lit it using the rocket as I could see they were not going to go for that. I was supposed to have people walking around checking stuff but they all got drunk in the back of my truck . The fire brigade had to be warned on the day it was happening even though they were in the meeting and new everything about it already and they still showed up, so I asked "what are you here for?" and a grinning bunch of firemen answered "ha we not missing this!" so they came to spectate! Lucky the event went with no problems as my risk assessment was "IT WILL BE FINE DONT WORRY" so I could have been in a lot of trouble. With the health and safety craziness, people will find it harder to push the boundaries and be creative which is a shame. Yes I did and well this is quite funny really while I'm trying to convince the council that this will be a safe event and they should just let me get on with it, the farmer rings me up and says " I've just been cutting the hedges and found that where your fire is, there's a high pressure gas main under it!" So the two weeks I had off work to build this thing up to the sky were spent moving it to a new location! Moving 24.000 pallets takes a long time so instead of the massive pyramid i ended up with a large block. However with the pallets I didn't have time to move were used to create the Wall of Death!